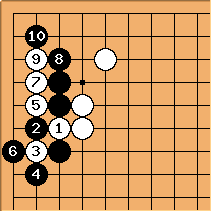 As Kageyama claims in his excellent book on fundamentals one of the basic rules of go is to get ahead and to bend first. 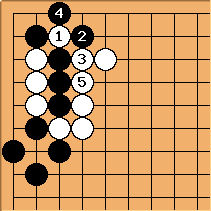 In order to do this a weakness of the marked point is considered tolerable in the joseki. 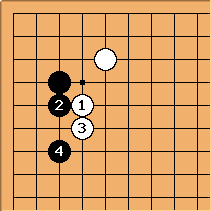 Now, I remember I played this against a 3 dan. It was one of my early games. 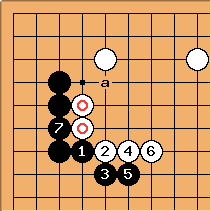 So, I played 4 as in the joseki book and only then started to read. What if White cuts through the gap? 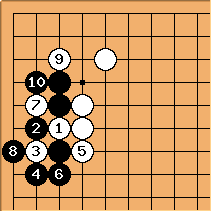 So, the crude cut does not work and Black is safe for the moment. But what happens if a white stone appears somewhere there? I remember sweating throughout the whole game. Not a pleasant experience. AvatarDJFlux For what I understand, the cut is not supposed to work, it is only played for aji in order to make some kikashi possible. 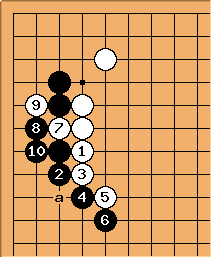 White 7 in the second diagram is a mistake not worthy of a 3 dan (5 there should have been sacrificed...), and the above diagram is a very bad result for White. HolIgor: Oh, it was not played. I just gave the variations that I had to read out in the game and sweat about possible change of the status when new stones appeared on the board. 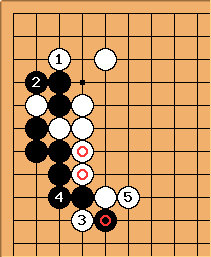 Provided White plays an extension at the top Black has to make the desired turn as soon as possible. Now, is a very cunning move. DJ Yeah, indeed! a becomes a juicy move for later... Can anybody see the sequence there? may be cunning, but is it sufficiently cunning to make surrendering sente worth it? Can't W simply sacrifice the marked stones as necessary? Alex Weldon: Well, it's honte, as well as aiming at a, so it's double-purpose.